Only 12% of voters say they have a favorable opinion of NFL Commissioner Roger Goodell, who is supporting player protests of the National Anthem at games. By comparison, blacks make up 12.6% of the population. The good news for Goodell is that most people don’t seem to know who he is. The bad news: those who do are three times more likely to have an unfavorable than favorable opinion of him. Yet he keeps his job, because it is normal for institutions to be run by liberal elite moonbats whom normal Americans loathe. The survey of 1,945 general election voters by the Remington Research Group also found that 64% of the public agrees with Trump that the zillionaire cavemen comprising the NFL ought to show some respect by standing for the national anthem. That number is disgustingly low, but it is still more than double the 25% who do not feel it is appropriate to behave respectfully while the Star-Spangled Banner is performed. Eighty percent want to see sports less saturated by the politics that Goodell et al. have injected by allowing the displays. But at least Sheila Jackson Lee will still watch the NFL. 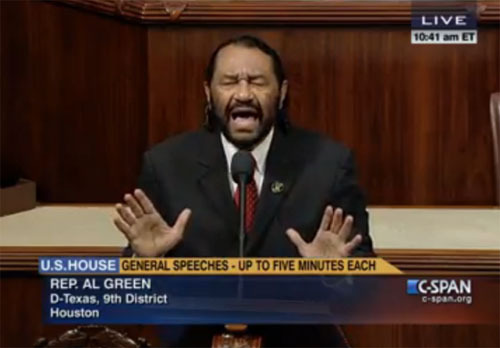 Rep. Al Green (D-Texas) said Tuesday that he will move to force a House floor vote to impeach President Trump next week as he denounced Trump’s attacks on NFL players protesting police brutality. Green, a member of the Congressional Black Caucus, stood on the GOP side of the House chamber to announce his plans to file a resolution that will automatically trigger a floor vote. Literally trying impeach Trump for opining that people ought to show respect for America is not going to enhance the vanishing appeal of the Democrat Party for average voters, most of whom have long since figured out that “police brutality” is a predominantly fictitious pretext for Black Lives Matter bullying, and who understand that the national anthem is worth defending from those who hate this country. The Dems are no longer a mainstream party. Hat tip: Liberty Daily. Cross-posted at Moonbattery.